Alexander Kravchenko was born on April 21, 1971 in Arkhangelsk, Russia. 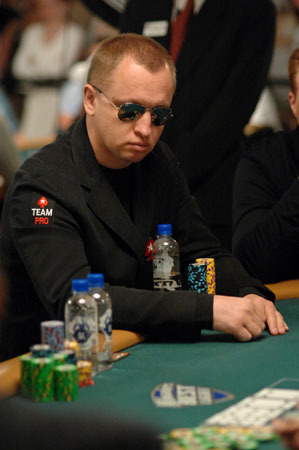 He holds one World Series of Poker (WSOP) bracelet, which he won in 2007, and his hometown is Moscow, Russia. 1997 was the year he first started playing poker. In 2007, he made it six times in the money in WSOP events. In one of these events, he came in 4th at the $1,500 Limit Omaha Hi/Lo event and won his first WSOP bracelet. He also finished 5th in the inaugural World Series of Poker Europe (WSOPE) event, 3rd in the Moscow Millions event and won the Austrian Masters, the Winter Tournament that was held in St. Petersburg, the Helsinki Freezeout, and the Pacific Poker Open that was held in the U.K.
Kravchenko's success in 2007 allowed him to pass Kirill Gerasimov to become the leading Russian player of all-time according to money wins. He's also the first Russian citizen who won a WSOP bracelet and as of 2008, he has won over $2,600,000 in live tournaments only. Kravchenko's plans are to stay and live in Russia as he sees this country his true home and besides playing poker, he is also involved in business. Alexander Kravchenko is also an active member of PokerStars Pro Team. Don't miss the thrill and excitement of a Grand Slam event. Watch the best tennis players live compete to win one of the most prestigious titles in tennis and be a part of history. Order your Australian Open tickets and witness greatness as it's happening on the court.